Best Built-In Gas Grills of 2018 - 4 Life Outdoor Inc. The top question we get asked is: Does this grill fit the BBQ cabinet? We took the list of best grills from BBQ Guys.com and added comments to all of them to see if they fit within our cabinets! If you have any questions regarding your grill fitting inside our grill cabinet, we would be happy to help you out. 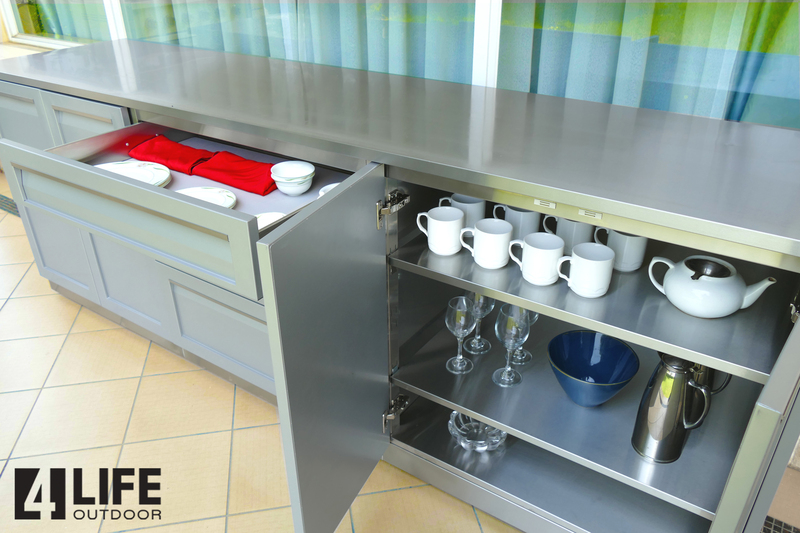 Our 40 inch grill cabinet can hold almost all 36 to 40 inch grills with no help. But there are some grills which are almost perfect but need a little help. The above image show a Coyote grill which has been raised and sides which do not reach the full width. Concrete board is used to fill the gaps between the grill and cabinet sides. The same tile is used to fill the gaps are used throughout the kitchen for consistency. This is a great way to have almost any grill fit our system! Here is some helpful information on the grill cabinets. 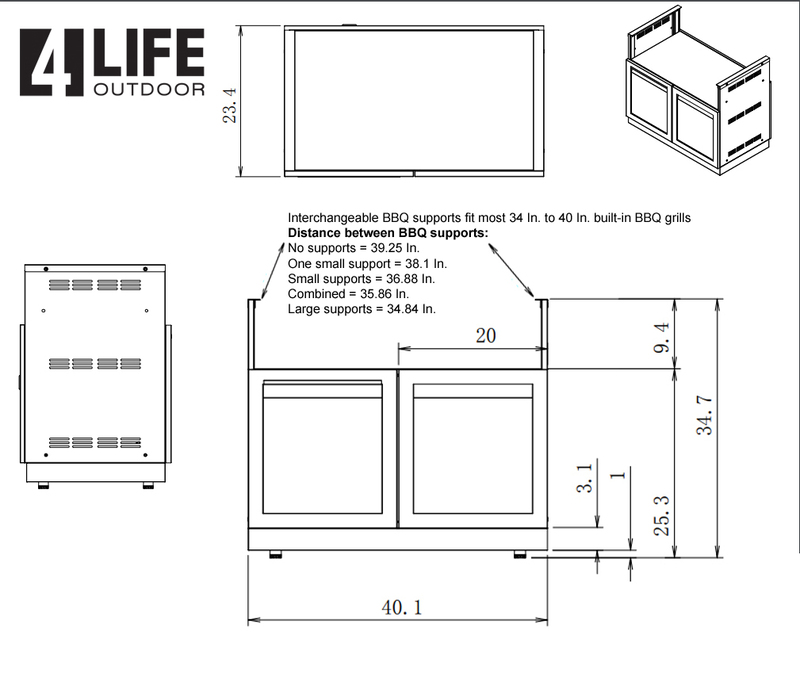 The grill cabinet comes with four grill supports – 2 large ones and 2 small ones. These can be interchanged to suit various grill drop-in grill width sizes. Using both large supports = 34.84 In. No supports used = 39.25 In. BBQ drop-in height without countertops: 9.4 In. Now onto which grill is best! When it comes to buying a new high-end gas grill, there are things you should consider before making your purchase. By making sure your new gas grill offers quality cooking performance, style, durability, and versatile cooking options, while providing many of the conveniences you’ll find in your indoor kitchen, you’ll ensure you’re happiness with your built-in gas grill for many years to come. 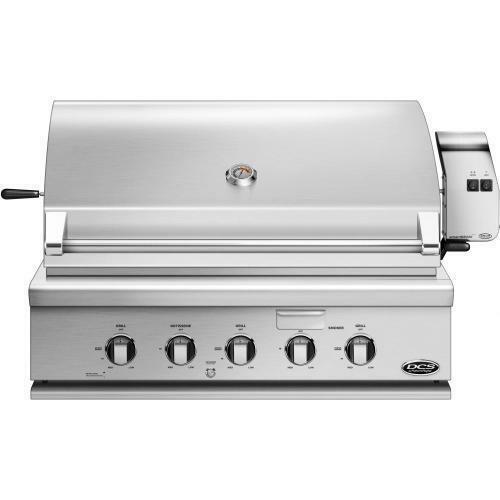 Lynx is definitely a great cooking grill that is incredibly well built and offers innovative, luxury features. But it’s Lynx’s style that helped it win this award this year. Let’s face it, we hear from designers all the time wanting their outdoor kitchen to look just as good as it cooks. More often then not, when looks matter, Lynx is the choice for these customers. We even had a customer who chose Lynx politely ask us to stop talking about how good it cooks, because he didn’t really plan on using it to cook with! It was simply going to be the showpiece of his backyard. This grill requires a cutout height of 10 7/8″ and width of 35″. Meaning this grill will require you to have custom stone countertops to lift the grill 1.5 inches. It would have 2.1 inches of space on the side of the grill to cabinet wall. The 2 inch gap can be easily caped with concrete board and tile as shown in the title image. If you’re looking for a grill with lots of features, solid engineering, plus a best-in-class lifetime warranty, look no further than Blaze Grills. The Blaze Professional boasts professional-quality, cast stainless steel H-burners, hexagon-shaped stainless steel cooking rods, and extra thick flame stabilizing grids. This grill is also packed with red LED lights on the control knobs and internal grills lights for cooking at night! High performance and sophistication, the Blaze Professional has all the quality at a fantastic value! Blaze also gives you peace of mind with an amazing lifetime warranty! This grill requires a cut out height of 10 1/2″ and a width of 32 1/4″. Meaning this grill will require you to have custom stone countertops. 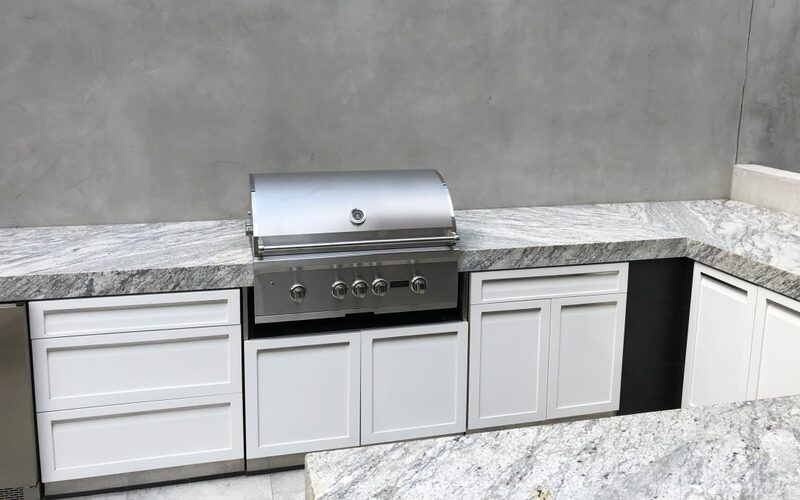 We recommend you place the grill on the stone and cover the gaps on the side of the grill with concrete board and finish it with the same countertop stone or black tile works well. Straight forward design, amazing performance, durable construction, easy operation, and a best-in-class lifetime warranty is what makes the Blaze 32-Inch the best mid-level gas grill for the money. 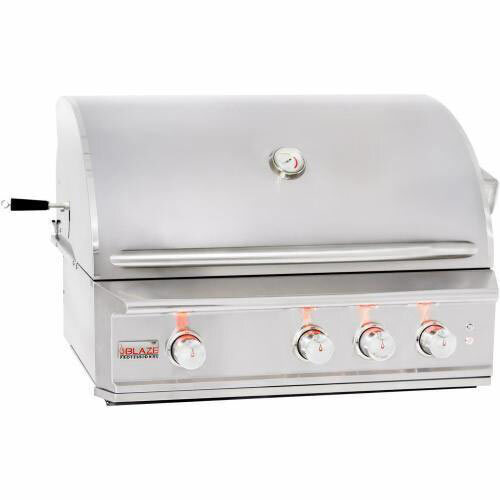 This grill features an all stainless steel body for remarkable durability and a flame stabilizing grid that prevents flare-ups and helps to spread the heat evenly across the grilling surface. 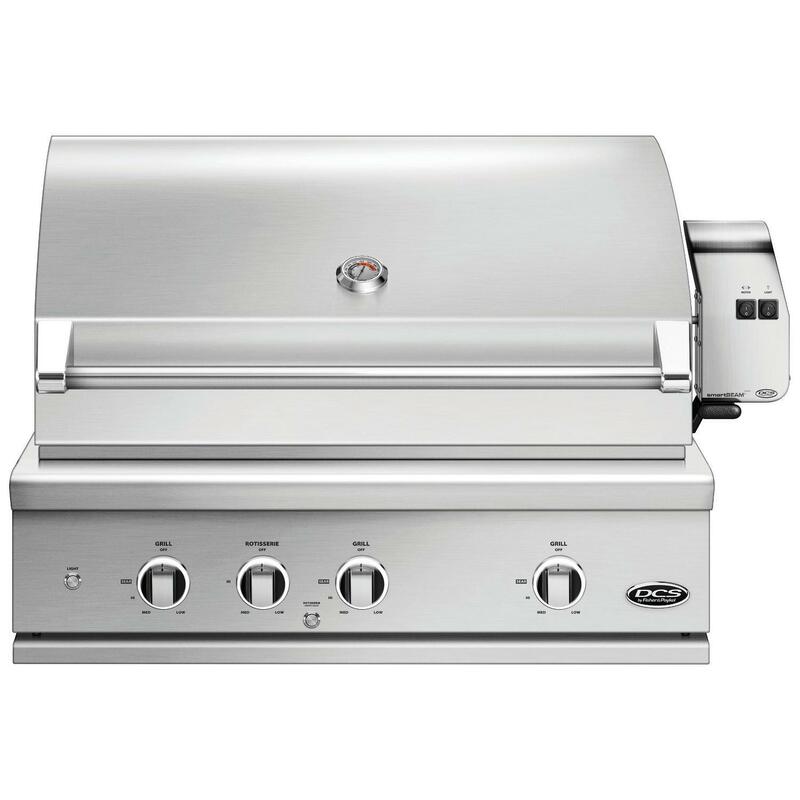 The grill is powered by four cast stainless steel burners and the push-and-turn ignition system easily lights up the grill. 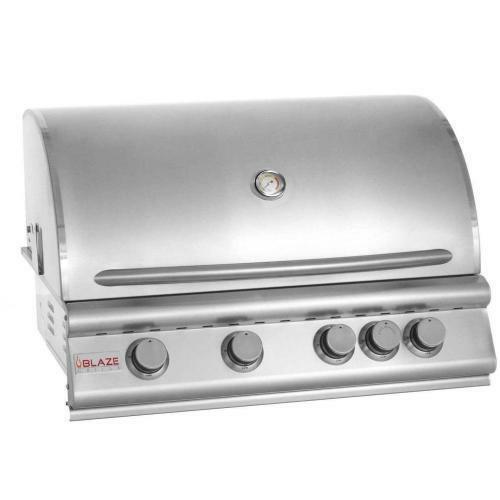 If your looking for the best value grill, then the Blaze 32-inch is for you. Too small a grill… We find 32 inch grills just too small. DCS Grills are uncompromising in their powerful performance. Engineered to deliver the functionality and power demanded by a professional chef, DCS Grills are hand-finished to complement the quality of your premium outdoor kitchen and built to withstand the demands of the serious cook in all seasons. The Series 9 DCS Grill provides the full package of beauty, brains and brawn. These grills cater for a wider repertoire of cooking styles and offer more room when cooking for a crowd with a secondary cooking surface. Stadium style hood lighting, bezel control lights and an easy to lift hood combine to take your outdoor cooking experience to the next level. This grill requires a cutout height of 10 1/8 inches and width of 34 1/2 inches. Meaning this grill will require you to have custom stone countertops to lift the grill 1 inch. It would have 2.3 inches of space on the side of the grill to cabinet wall. The 2 inch gap can be easily caped with concrete board and tile as shown in the title image. The DCS Series 7 Traditional 36-inch gas grill cooks quickly, evenly, and precisely, making it the best performing gas grill there is! Its stainless steel U-shaped burners that are capable of producing a wide temperature range from 300 degrees to an intense 1,100 degrees. The ceramic rods radiate the heat and produce incredibly even heat distribution. This allows the grill to offer a cooking experience that’s up to par with commercial establishments, keeping your food deliciously juicy while still being cooked to your exact specifications. 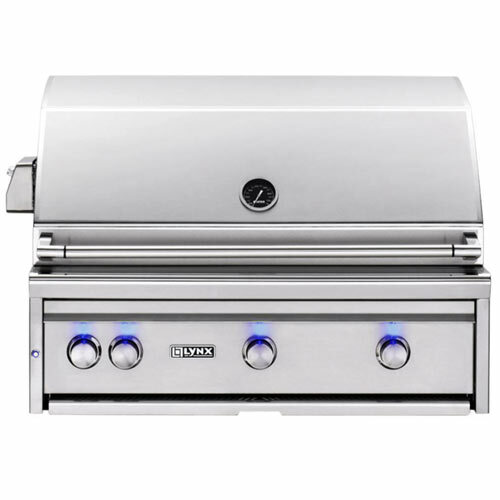 The Napoleon LEX 605 offers an excellent value, especially considering the grills innovative accessories and features. 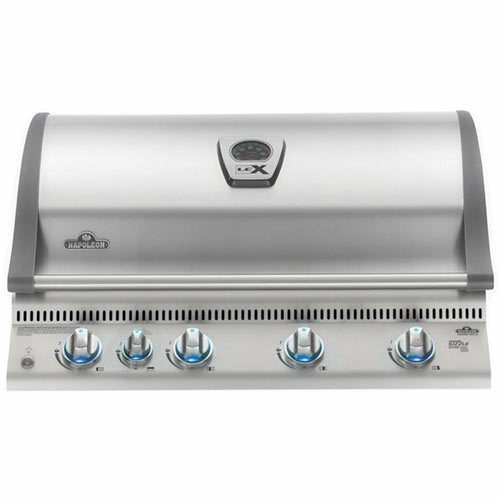 The LEX 605 features an infrared rear burner, infrared “sizzle-zone” burner, and I-Glow backlit control knobs to help you entertain and cook at night. Another great feature is the grill’s doubled lined “lift-ease” lid, which opens easily and helps hold in heat for oven like cooking. The lid is hinged near the middle, and when open adds hardly any depth to the back of the grill allowing for easy placement in a variety of spaces. If you’re a fan of Napoleon, this is definitely a grill to consider for the money.